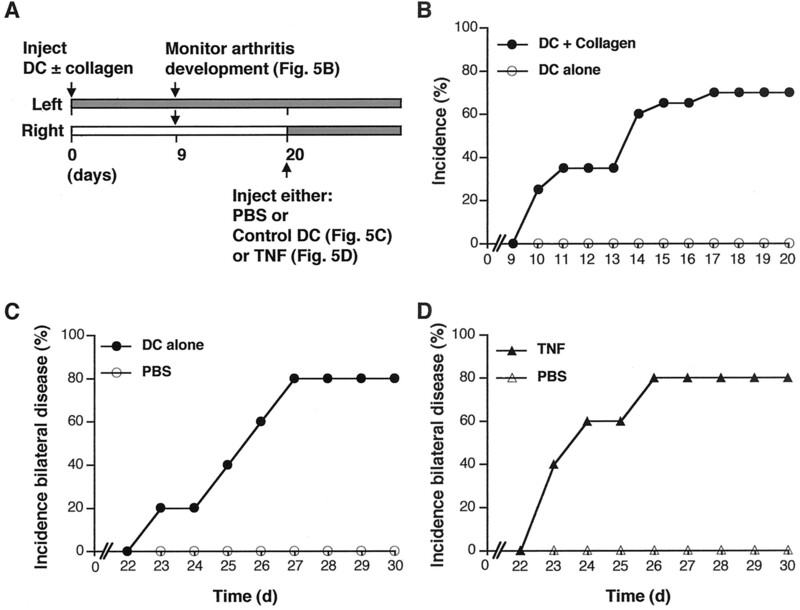 Transferring collagen-pulsed, bone marrow-derived dendritic cells (DCs) into congenic DBA/1 recipient mice produced arthritis in joints adjacent to the site of DC transfer and could be inhibited by treatment with TNF antagonists. Disease was Ag specific, as transfer of control, unpulsed DCs, or DCs pulsed with OVA did not produce arthritis. In contrast to other experimental arthritis models, DC-induced arthritis localized to the site of injection and did not spontaneously generalize to uninvolved joints, despite the demonstration of circulating collagen-reactive T cells. Similarly, transfer of T cells primed by collagen/DCs was not sufficient to produce arthritis in recipient mice. In collagen/DC-primed mice however, disease could be induced in uninvolved joints by local administration of noncollagen-pulsed DCs and this could be reduced through TNF inhibition. Similarly, injection of collagen/DC-primed mice with low-dose TNF also resulted in local induction of arthritis, as did administration of TNF to mice receiving T cells from collagen/DC but not OVA/DC-primed mice. Thus, we have demonstrated for the first time that administration of collagen-pulsed mature DCs is sufficient for the induction of arthritis. Furthermore, this disease process is mediated through both adaptive and innate effects of DCs; first, priming of autoreactive T cells and, second, induction of local inflammation via mediators such as TNF. The pathogenesis of most inflammatory arthopathies and, in particular, the net contribution of T cells remain controversial. Recently, several candidate autoantigens have been detected in rheumatoid arthritis (RA)3 patients, generating renewed interest in those mechanisms whereby naive T cells can be primed to become autoreactive T cells and in turn promote inflammatory articular disease (1). Dendritic cells (DCs) are particularly relevant in this context because of their potent Ag-presenting activity and unique ability to activate naive T cells (2, 3, 4). DCs are strategically situated in diverse locations such as the epidermis and gastrointestinal mucosa, where the potential for invasion by pathogens is high (2, 5). However, DC populations have also been described in the synovial membrane in RA, although their functional contribution to disease remains difficult to assess (6, 7, 8). Advances in the culture and isolation of DCs have enhanced our understanding of their biology (9, 10) and demonstrated the existence of subsets of DCs that have been proposed to represent discrete stages of differentiation (11, 12) or distinct lineages (13, 14, 15). Nonlymphoid DCs found in tissues are specialized for high Ag capture (16, 17); however, for optimal T cell activation, these cells must mature to acquire increased Ag presentation and costimulatory activity (4, 5). These maturation events have been well described for myeloid DC and are dependent on bacterial products such as LPS (18, 19), cytokines, in particular TNF (18), or ligation of CD40 through T cell interactions (20, 21). Of significance for autoimmune diseases, the potent Ag-presenting activity of DCs is not restricted to foreign Ags, since host proteins have also been demonstrated to be efficiently presented by DCs (22, 23). Development of an arthritis model in which the precise contribution of DCs could be examined would therefore be of considerable value in understanding the pathogenesis and evaluating novel therapeutics. Ag-pulsed DCs have been shown to induce disease in a murine model of multiple sclerosis, experimental autoimmune encephalomyelitis (24). In contrast, the roles that DCs may play in the induction of experimental models of arthritis remain uncharacterized. Although collagen-induced arthritis (CIA) in DBA/1 mice has previously been used to estimate the relative contribution of immune cell subsets, significant problems arise in interpreting mechanisms whereby articular inflammation is induced, reflecting the ill-defined contribution of CFA (25, 26) which is necessary for CIA induction. Interestingly, IFA results only in the development of low-grade CIA, illustrating the essential role of bacteria or bacterial extracts for arthritis induction (27). One possible role of these bacterial products may be to activate DCs that are presenting arthritogenic peptides (18, 19). In the current study, we demonstrate for the first time that transfer of collagen-pulsed mature DCs is sufficient to induce arthritis in DBA/1 mice. Furthermore, we have used this novel model to elucidate that this disease process is mediated through two distinct effects of DCs, one involving priming of autoreactive T cells and a second related to the induction of proinflammatory agents such as TNF. DCs were generated from the bone marrows of DBA/1 mice (obtained from Harlan Olac, Bicester, U.K.) by culture in GM-CSF-conditioned medium as previously described (28). FACS analysis of CD11c and MHC class II (I-Aq; BD Biosciences, Oxford, U.K.) expression confirmed routine yields of >80% pure DC cultures, with no detectable levels of expression of CD8α (BD Biosciences). DCs were activated by overnight incubation with 1 μg/ml LPS (from Salmonella abortus equi; Sigma-Aldrich, Poole, U.K.) and, where appropriate, were simultaneously loaded with type II collagen (50 μg/ml; Sigma-Aldrich) or OVA (100 μg/ml; Worthington Biochemical, Lakewood, NJ). Overnight incubation of these cells with LPS, with or without Ag, produced mature DCs characterized by increased surface expression of class II MHC, CD40, CD80, and CD86 (28). Prior to transfer, cells were collected and washed with RPMI 1640 supplemented with 100 IU/ml penicillin, 100 μg/ml streptomycin, and 2 mM l-glutamine (incomplete RPMI 1640; all from Life Technologies, Paisley, U.K.). Arthritis was induced in male DBA/1 mice (Harlan Olac) by s.c. administration of 2 × 105 collagen-pulsed mature DCs into each hind footpad. Control mice received mature DCs pulsed with OVA or mature unpulsed DCs. Mice were subsequently monitored for signs of arthritis as described previously (27). Disease was scored based on erythema, swelling, or loss of function present in each paw on a scale of 0–3, giving a maximum score of 6 per mouse. Paw thickness was measured with a dial caliper (Kroeplin, Munich, Germany). The effects of TNF neutralization on the development of DC-induced arthritis (DCIA) was determined by i.p. administration of TNF receptor type II-IgG fusion protein (Wyeth-Ayerst Pharmaceuticals, St. Davids, PA), or control IgG (50 μg/mouse) every 2 days from the onset of disease. In some experiments, T cells were purified from peripheral lymph nodes of DC-transferred mice using T cell enrichment columns (Biotex Laboratories, Edmonton, Canada). This method produced cell suspensions containing >95% CD3+ T cells as assessed by FACS analysis. Purified T cells (1 × 106) were then transferred i.v. into DBA/1 mice and the development of arthritis was monitored as described above. To determine the effects of inflammation and lymphocyte recruitment on the spread of disease, TNF, or the CXCR4 chemokine, stromal cell-derived factor 1 (SDF-1; Ref. 29) (50 ng/mouse; both from R&D Systems, Oxon, U.K.) was injected s.c. into the hind footpads of DBA/1 mice on days 20 and 21 following priming with collagen-pulsed DCs. In T cell transfer studies, TNF (50 ng/mouse) was injected into the hind footpads of mice on days 0 and 1 following T cell transfer. Control mice received s.c. PBS only. For histological assessment, mice were sacrificed and the hind limbs were removed and fixed in 10% neutral-buffered Formalin, and 5-μm sections were stained with H&E or toludine blue (both from Sigma-Aldrich). The quantification of arthritis was by “treatment-blind” observers and a histological score was assigned to each joint based on the degree of inflammation, synovial hyperplasia, and erosion as described previously (30). For fluorescence imaging, DCs were labeled by incubating in incomplete RPMI 1640 containing 1 μM CellTracker Green 5-chloromethyl-fluorescein diacetate (CMFDA; Molecular Probes, Eugene, OR) for 30 min at 37°C (31). Cells were then washed and resuspended in complete RPMI 1640 (plus 10% FCS; Life Technologies, Grand Island, NY) for 30 min to activate the fluorescent probe. Cells were washed and resuspended in incomplete medium immediately prior to transfer. Draining lymph nodes were removed 48 and 96 h following transfer and snap frozen in liquid nitrogen. Sections (6–8 μm) were cut from these tissues, fixed in acetone, and treated with 0.1% sodium azide/3% H2O2 in PBS to quench endogenous peroxidase. Fc receptor binding of Abs was blocked with anti-CD16/CD32 Ab (2.4G2; BD Biosciences) prepared in 10% mouse serum and 0.05% azide. Sections were then labeled with PE anti-CD4 (L3T4; BD Biosciences) or rabbit antiproliferating cell nuclear Ag (PCNA; Santa Cruz Biotechnology, Santa Cruz, CA) (32). PCNA labeling was amplified using biotin anti-rabbit IgG (Vector Laboratories, Burlingame, CA) and streptavidin HRP (Vector Laboratories) followed by the tyramide signal amplification biotin system (NEN Life Science Products, Boston, MA). PCNA staining was visualized using Texas Red-streptavidin (Vector Laboratories). Control and labeled tissue sections were examined on an Axioskop microscope (Zeiss, Oberkochen, Germany) and images were captured by a cooled charge-coupled device camera (Digital Pixel, Brighton, U.K.) onto an Apple Macintosh computer using IP lab software (Scanalytics, Fairfax, VA). Images were then processed using Adobe Photoshop version 5.0 (Adobe Systems, San Jose, CA). Draining lymph nodes were removed at the end of in vivo experiments. Single-cell suspensions were prepared and cultured in triplicate at 2 × 106 cells/ml in RPMI 1640 containing 1% mouse serum at 37°C in 5% CO2. Cells were stimulated with either medium alone, 50 μg/ml type II collagen, or 100 μg/ml OVA in flat-bottom 96-well plates (Nunc, Roskilde, Denmark). Supernatants were harvested after 72 h and stored at −20°C for cytokine assay. Proliferation assays were performed in parallel cultures in U-bottom 96-well plates (Nunc) for 96 h and were pulsed with [3H]thymidine (Amersham, Aylesbury, U.K.) during the last 6 h of culture. Cells were then harvested and measured for incorporation of radioactivity as previously described (27). All cytokines were detected by ELISA as described previously (27). The Ab pairs were as follows: TNF (BioSource International, Nivelles, Belgium), IFN-γ (R&D Systems), IL-2, IL-5, IL-6, and IL-10 (BD Biosciences), and assays were performed according to the manufacturers’ instructions. Detection limits were as follows: IL-2, IL-5, IL-6, and TNF all at 10 pg/ml; IL-10 at 20 pg/ml and IFN-γ at 40 pg/ml. Statistical analysis was performed using Minitab software (Minitab, State College, PA). Clinical and histological scores were analyzed with the nonparametric Mann-Whitney U test. Cytokine levels were compared using Student’s t test. Mature DCs were transferred s.c. into the footpads of DBA/1 mice and the subsequent development of inflammatory arthritis was monitored for frequency (Fig. 1⇓A) and severity (mean articular index; Fig. 1⇓B). Transfer of collagen-pulsed mature DCs into recipient mice was sufficient for the induction of arthritis, first evident at day 10 after cell transfer in up to 80% of recipients. Development of DCIA was partially inhibited by TNFRp75-Ig but not control Ig administration (Fig. 1⇓C). Collagen-specific responses were critical since, in contrast, transfer of mature, unpulsed DCs alone, or OVA-pulsed DCs did not induce arthritis. Sequential histological analyses were performed which revealed early predominance of neutrophils up to day 20 followed by mononuclear cell infiltration. Established DCIA exhibited extensive synovial hyperplasia and mononuclear inflammatory cell infiltration (Fig. 2⇓, A and C; Table I⇓). Appearances resembled those of CFA-induced CIA (30) and RA synovial tissue (33, 34). 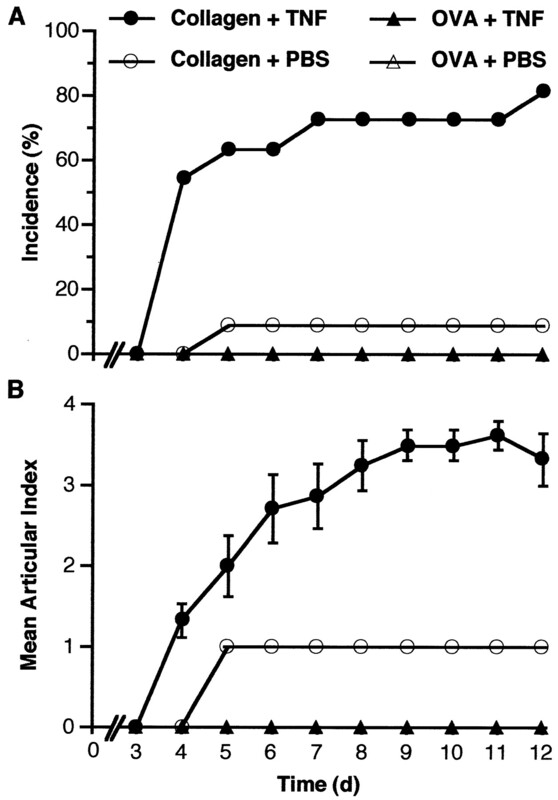 Commensurate with clinical observations, joints of mice receiving unpulsed DCs exhibited no apparent local inflammatory reaction (Fig. 2⇓, B and D). Collagen-pulsed DCs induce the development of arthritis in congenic DBA/1 mice. A, Arthritis induction could be observed in mice 10 days after footpad injection of mature collagen-pulsed DCs (n = 31), with up to 70% of mice developing arthritis by day 16. Mature DCs pulsed with OVA (n = 12) or unpulsed DCs (DC alone; n = 20) did not result in arthritis induction. B, The severity of disease was scored by the mean articular index. C, The incidence of arthritis induction by collagen-pulsed DCs was partially inhibited by the i.p. administration of 50 μg of TNFRp75-Ig, but not control Ig every 2 days following the onset of disease (n = 10). Data represent the mean ± SEM of the indicated number of mice. DCIA is associated with synovial hyperplasia and inflammatory cell infiltration in the involved joint. 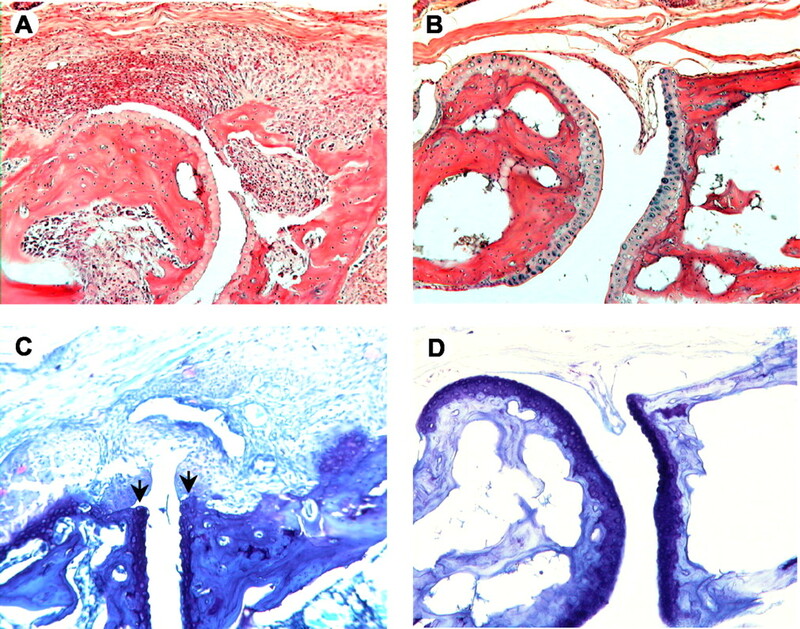 Histological analysis of the local joints of mice following footpad inoculation with mature collagen-pulsed DCs demonstrated extensive synovial hyperplasia and inflammatory cell infiltration (A) and cartilage erosion (C; n = 8). B and D, Analysis of joints of mice receiving unpulsed DCs revealed no apparent inflammatory cell involvement (n = 8). Original magnification, ×50. We next characterized the nature of T cell responses in DC recipients. When draining lymph node cells were restimulated with collagen in vitro, significant levels of proliferation and cytokine production were detected only in cultures prepared from collagen-pulsed DC recipients (p < 0.05) and not unpulsed DC recipients (Fig. 3⇓). Ag-dependent production of proinflammatory cytokines including TNF and IL-6 was detected (p < 0.05, Fig. 3⇓, B–E). Similarly, significant IFN-γ and IL-2 production was observed (p < 0.05), whereas IL-5 was not detected, suggesting a predominant Th1-type response (35, 36). Spontaneous production of IL-10 could also be detected, which was not however further induced by incubation with collagen in vitro (Fig. 3⇓F). Analysis of the specificity and phenotype of T cells in the draining lymph nodes of mice 22 days after transfer of mature collagen-pulsed or unpulsed DCs (DC alone). A, Significant levels of collagen-specific T cell proliferation and cytokine production (B–F) could only be detected in lymph nodes isolated from mice receiving collagen-pulsed DCs (∗, p < 0.05) and not control DCs. 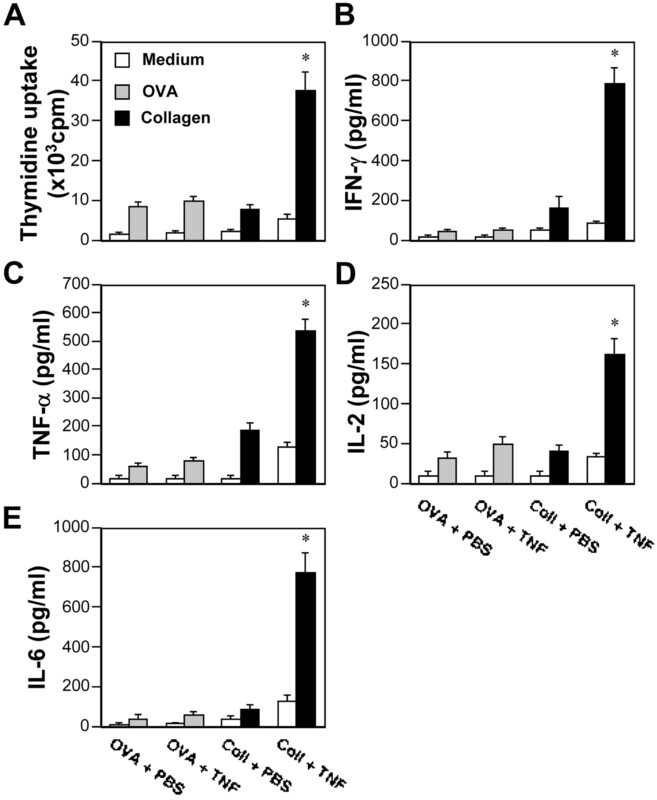 F, Transfer of collagen-pulsed DCs induced spontaneous IL-10 production. Data represent the mean ± SEM (n = 5). We next sought to define the precise location at which DCs induced the foregoing T cell responses in vivo, leading to development of inflammatory arthritis. Mature collagen-pulsed DCs labeled with CMFDA prior to transfer were tracked in vivo using lymph node sections prepared from popliteal and inguinal draining lymph nodes. DCs were readily detected at day 2, with subsequent reduction in numbers by day 4. DCs were localized in close proximity to CD4+ T cells (Fig. 4⇓, A–D). To determine whether DCs had any functional effect on local T cells, we analyzed the expression of PCNA (32) (Fig. 4⇓, E and F). PCNA-positive cells could be identified adjacent to the transferred DCs, indicating that local DNA synthesis and proliferation were taking place in the T cell areas of the lymph node. Localization of mature collagen-pulsed DCs in draining lymph nodes. A, At day 2 after transfer, CMFDA-labeled, collagen-pulsed DCs (green) localized with CD4+ T cells (red) in inguinal lymph nodes (n = 3). B, At 4 days, a similar distribution of lower numbers of DCs was observed (n = 3). C and D, DCs were also seen in similar areas of popliteal lymph nodes. E and F, A number of cells closely associated with DCs (green) expressed PCNA (red) in inguinal lymph nodes at day 2 and to a lesser extent at day 4. Original magnification: A–D, ×400 and E and F, ×630. We next investigated whether the primary role of DCs in this model was to induce Ag-specific T cell responses and thereby initiate disease. We generated collagen- or OVA-specific T cell populations by injecting appropriately pulsed mature DCs into DBA/1 mice. T cell populations were then purified from lymph nodes of immunized mice and were transferred i.v. into congenic recipients. Ag-specific proliferation and cytokine production were observed in cultures of appropriately restimulated splenocytes isolated from these recipient mice 12 days after cell transfer (data not shown). However, arthritis onset was not observed in the majority of recipient mice (only one collagen-specific T cell recipient developed low-grade arthritis; data not shown). These data suggested that T cell priming alone was an insufficient explanation for the role of DCs in DCIA. An important feature of DCIA was the exclusive localization of arthritis to those joints proximal to the site of DC transfer (Fig. 5⇓, A and B) despite the presence of recirculating collagen-reactive T cells. It seemed likely that disease localization arose from signals delivered in the articular environment by DCs themselves, irrespective of specific Ag presentation. To test this hypothesis, we administered noncollagen-pulsed mature DCs into the contralateral footpads of mice originally primed with collagen-pulsed DCs. This resulted in contralateral transfer of disease into the previously uninvolved joints (Fig. 5⇓C). Such inflammation arose with more rapid kinetics than initial disease onset and was associated with recurrence of left footpad inflammation representing bilateral disease. 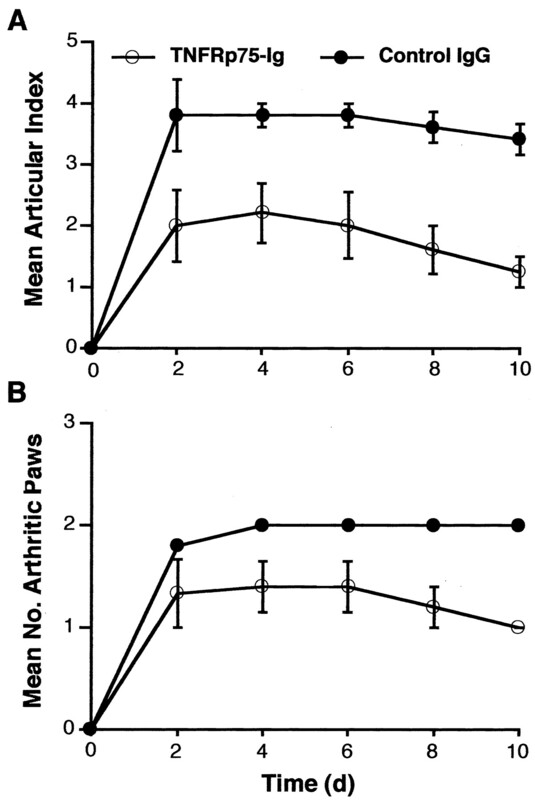 In contrast, mice that initially received noncollagen-pulsed DCs and that subsequently received noncollagen-pulsed DCs in the contralateral footpads did not develop any signs of arthritis (data not shown). DCs and TNF regulate the contralateral transfer of arthritis in collagen-pulsed DC recipients. A, Experimental protocol. Mice were injected s.c. in the left hind footpads with mature collagen-pulsed DCs and arthritis development in the left and right footpads was measured. B, Collagen-pulsed DCs, while inducing arthritis in joints proximal to the site of administration, do not induce arthritis in the contralateral joints of recipient mice (n = 20). C, Subsequent injection on day 20 of noncollagen-pulsed mature DCs (n = 5) or low-dose (D; 50 ng) TNF (n = 5) into the right hind footpads induced arthritis in the right hind limb joints. Injection of PBS (n = 10) did not produce this effect. Control mice treated with unpulsed DCs did not display arthritis in either footpad after further treatment with either control DCs (n = 5) or low-dose TNF (n = 5; data not shown). Several candidate pathways could explain this effect of mature DCs, including chemokine or cytokine release. To explore this, we administered low doses of TNF or SDF-1 into the right hind footpad of mices that had received collagen-pulsed DCs in the opposite footpads 20 days previously (Fig. 5⇑D). Whereas sham injection with PBS did not induce local inflammation, administration of TNF (Fig. 5⇑D) resulted in induction of arthritis in joints local to the site of injection in >70% of the mice. The induction of arthritis in these joints also occurred rapidly, within 3–6 days following treatment with TNF. This was not merely dependent on chemokinetic activity since SDF-1 was ineffective in inducing local disease (data not shown). In contrast, mice that initially received noncollagen-pulsed DCs and that subsequently received TNF in the contralateral footpad did not develop any signs of arthritis (data not shown). These data also predicted that TNF injection might be sufficient to overcome the previously noted inability of adoptively transferred collagen-specific T cells to induce arthritis. Thus, hind footpad injection of TNF induced rapid onset of severe arthritis in 80% of collagen-specific T cell recipients (Fig. 6⇓). Local Ag recognition was crucial since OVA-primed T cell recipients did not develop disease despite local TNF injection (Fig. 6⇓). Moreover, local TNF injection also produced a significant increase in Ag-specific spleen cell proliferation and cytokine production in mice that had received collagen-specific T cells (p < 0.05). Importantly, this was not the case when OVA-primed cells had been transferred (Fig. 7⇓). These data suggest that arthritis induction was associated with enhanced systemic responses to collagen but not to OVA in vivo. TNF induces arthritis in mice adoptively transferred with T cells from mice primed with collagen-pulsed DCs. Purified T cells were prepared from DBA/1 mice primed with OVA- or collagen-pulsed DCs and transferred i.v. into congenic recipients. Subcutaneous injection of low-dose TNF (50 ng) in the footpad induced significant incidence (A) and severity (B) of arthritis in recipients of collagen-primed (n = 11) but not OVA-primed (n = 5) T cells. Data represent the mean ± SEM. 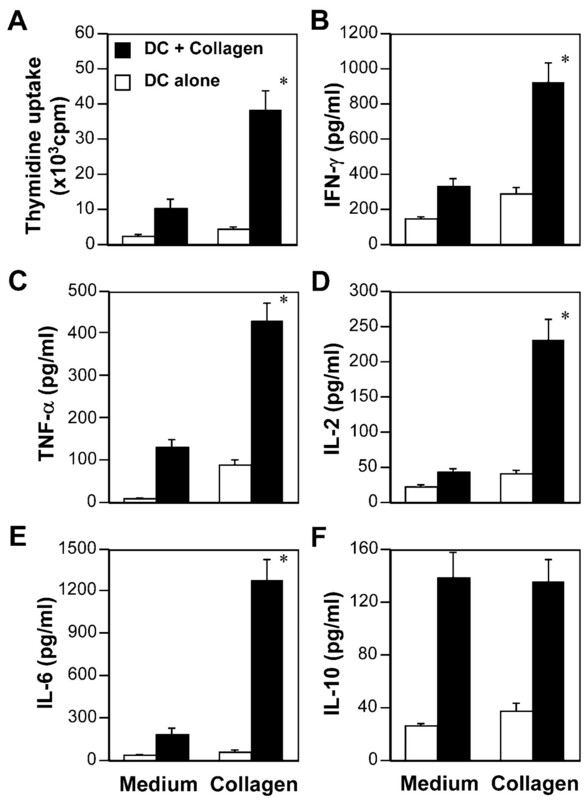 Effects of TNF administration on lymph node T cell responses in the recipients of T cells from mice primed with Ag-pulsed DCs. DBA/1 mice were primed with mature collagen-pulsed or OVA-pulsed DCs. Lymph node T cells were purified and adaptively transferred i.v. into congenic recipients that were then injected s.c. in the footpads (days 0 and 1) with either TNF (50 ng/mouse) or PBS. Lymph node cells were harvested from the recipients 12 days after T cell transfer and stimulated in vitro with OVA or collagen. 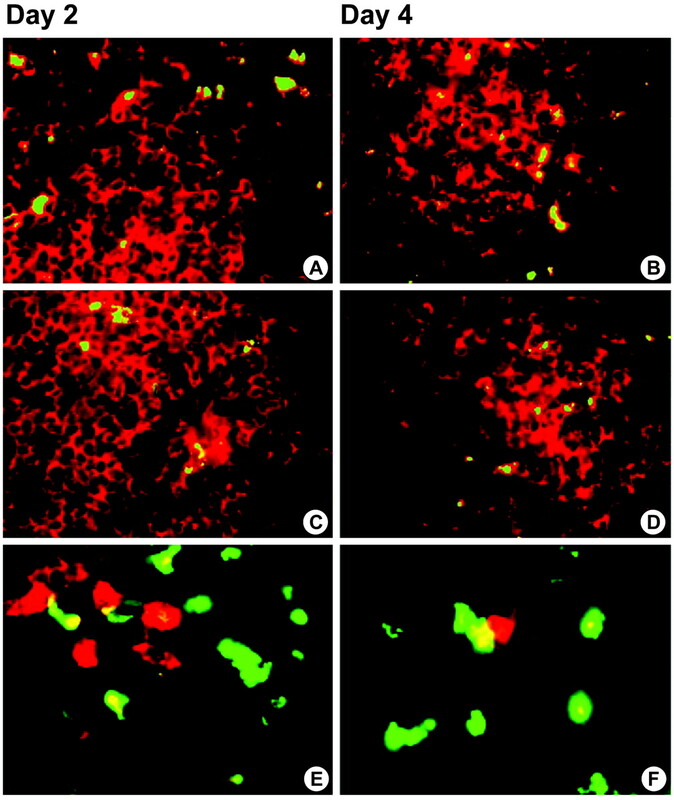 Lymph node cells from the recipients proliferated (A) and produced significant amounts of cytokines (B–E) when stimulated with specific Ags. Both T cell proliferation and cytokine production were markedly enhanced by the treatment of TNF only in the group transferred with collagen-pulsed DCs but not in OVA-pulsed DCs. Data are the mean ± SEM, n = 5. ∗, p < 0.05 compared with all other groups. The foregoing data clearly indicated a crucial role for TNF in promoting local inflammation in DCIA. Neutralization of TNF using TNFRp75-Ig in mice primed with collagen-pulsed DCs reduced the severity of disease induced by injection of nonpulsed DCs in the contralateral footpad (Fig. 8⇓). This clearly indicated that one effect of TNF blockade in RA in vivo could be mediated through suppression of DC-mediated amplification of articular inflammation. TNFRp75-Ig reduced contralateral transfer of disease induced by administration of unpulsed DCs to collagen-pulsed DC recipients. DBA/1 mice were primed with mature collagen-pulsed DCs (day −20) in the left hind footpads and injected s.c. in the right hind footpads with mature unpulsed DCs (day 0). TNFRp75-Ig was injected i.p. (50 μg/mouse) immediately after injection of the unpulsed DCs and every 2 days thereafter. Disease severity and incidence were monitored in all joints. Mice treated with TNFRp75-Ig showed a significantly reduced severity of arthritis (A) compared with mice treated with the control IgG and contralateral transfer of disease was almost absent (B). Data are the mean ± SEM; disease severity was compared by mean area under the curve (p < 0.05; n = 5). The data presented here clearly demonstrate that presentation of collagen-derived peptides by mature DCs is sufficient for the induction of arthritis in DBA/1 mice. As with other models, the induction of arthritis could be inhibited by neutralization of TNF using TNFRp75-Ig (37, 38, 39). The Ag specificity of this response could be demonstrated by the lack of arthritis induced by unpulsed DCs or DCs pulsed with OVA. Furthermore, the presence of collagen-specific T cells could be demonstrated following in vitro incubation of draining lymph node cells from these mice with collagen, which resulted in proliferation and Th1 cytokine production (36, 40). The simplicity of this model is in contrast to previously described models of arthritis where the presence of ill-defined nonspecific adjuvants were required for arthritis induction (41, 42). However, one important feature in common with both the system described here and immunopotentiation by adjuvants is the activation of DCs (19, 26, 43). Thus, it appears that despite the myriad effects of adjuvants on the immune system, the activation of DCs is critical and sufficient for the induction of arthritis. Activation of DCs involves a number of phenotypic changes which are appropriate for enhanced T cell activation, as well as modulation of chemokine receptors resulting in the migration of DCs to the T cell areas of local lymph nodes (44, 45). In the present study, collagen-pulsed DCs (CMFDA+) could be observed in the T cell areas of popliteal and inguinal lymph nodes 2 days after transfer, and some of the CD4 cells associated with these DCs were activated (PCNA+) (32). These observations suggest that the role of DCs in the inductive phase of arthritis in this model involves activation of T cells in local lymph nodes. An interesting feature of the model described here is the lack of induction of polyarthritis, a characteristic of other arthritic disease models (41, 42). Thus, upon transfer of DCs into the footpad of recipients, arthritis is only observed in the local joints and does not spread contralaterally or into any of the anterior joints despite clear evidence of a systemic, collagen-specific T cell response. Although no gross inflammation was evident at the site of injection, it is likely that the transient and focal inflammation induced by administration of DCs may be sufficient to induce local endothelial activation and to allow primed T cells access to the local joints. This hypothesis is supported by our observation that arthritis developed local to the site of injection of unpulsed DCs in mice previously primed in the contralateral footpad with collagen-pulsed, but not unpulsed DCs. These studies therefore demonstrate the importance not only of effective T cell priming but also of local inflammation in the induction of disease following DC transfer. Central to this event is TNF, which allows T cells to gain access to tissues through its ability to activate endothelial cells and to induce chemokine gradients (46). To test this hypothesis, we administered low doses of TNF or chemokines (SDF-1) into the uninvolved footpads of mice that had already been primed by transfer of DCs in the contralateral footpads. Arthritis developed in the TNF-treated, but not the SDF-1-treated footpads of mice primed with collagen, but not OVA-pulsed DCs. Because SDF-1 failed to induce spread of disease into uninvolved joints, these results further emphasize the primary role played by endothelial activation in the induction of arthritis. Arthritis induced by injection of unpulsed DCs into the contralateral footpad could be partially inhibited by treatment with TNFRp75-Ig, indicating that DCs may produce TNF or act indirectly to induce TNF production in vivo. The lack of complete inhibition may be due to incomplete neutralization of TNF or the involvement of other mediators in addition to TNF in the activation of disease. Interestingly, we also observed that TNF treatment of mice receiving collagen-primed T cells increased in vitro splenocyte responses, whereas administration of TNF to OVA-primed T cell recipients did not produce an equivalent increase in T cell reactivity on exposure to OVA in vitro. The collagen-specific effect of TNF suggests further roles for this cytokine, in addition to the induction of T cell egress, in arthritis development. It appears likely that following TNF treatment, collagen-specific T cells can gain access to the joint where they recognize autoantigen and become further activated. This secondary event may then allow the activation of synovial DCs, as observed previously (6, 7, 8), thus inducing further local activation of autoantigen-specific T cells. This function of TNF may be distinct from its pathological role associated with the inflammatory cytokine cascade. Commensurate with this, recent studies analyzing the clinical effects of anti-TNF therapy (infliximab) in patients with RA showed a decrease in the number of joint-infiltrating lymphocytes and a corresponding increase in circulating lymphocytes on initiation of treatment (47). Collectively, these data indicate two significant roles for TNF in arthritis, one during DC maturation and a second in activating the vascular endothelium to allow access of reactive T cells into the joint to initiate synovial inflammation. Our results therefore not only demonstrate a novel model of experimental arthritis, but also reveal a dual role for DCs in the induction of arthritis. These studies have also significantly advanced our understanding of the mechanisms of anti-TNF therapy in RA. We thank Peter Kerr (Department of Pathology, Western Infirmary, Glasgow, U.K.) for providing technical assistance with histology. ↵1 This study was supported by a Wellcome Trust Career Development Fellowship (to J.M.B.). B.P.L. was supported by the Medical Research Council. D.H. was supported by the Arthritis Research Campaign. Image analysis equipment used in these studies was provided through a grant from The Royal Society. ↵3 Abbreviations used in this paper: RA, rheumatoid arthritis; DC, dendritic cell; DCIA, DC-induced arthritis; CIA, collagen-induced arthritis; SDF-1, stromal cell-derived factor 1; CMFDA, 5-chloromethyl-fluorescein diacetate; PCNA, proliferating cell nuclear Ag.